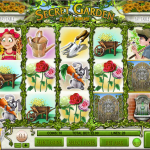 Secret Garden is a 5 reels 20 paylines slot game by Rival. As you can imagine there is a garden here but this garden hold some secrets and to find out what they are you will need to step inside. Your adventure will take place over a nice green lush background taken out of a children book. 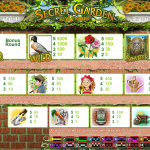 The Wild in this game is the Duck symbol and it will substitute other symbols (except the scatters) to complete a winning combination. There are also two scatters in this game. The first one is the Gate symbol and landing 3, 4 or 5 will win you 20, 30 or 50 Free Spins respectively. This also comes with a 2x multiplier for your wins and the chance to re-trigger the free spins when landing more scatters. The second scatter is the Master Key scatter and landing 3 or more will trigger the Bonus Game. You will be taken to a different screen where you will lead a gardener and water the soil until you grow some plants. Then you move him to collect prizes that rise from the soil. Secret Garden is a pretty polished game. It is fun, interactive, engaging and has very good bonus features. The RTP is pretty ok at 96% so we feel pretty good about you liking this game. Do you like hunting monsters? Try playing Scary Rich 3 a 5 reel slot by Rival.